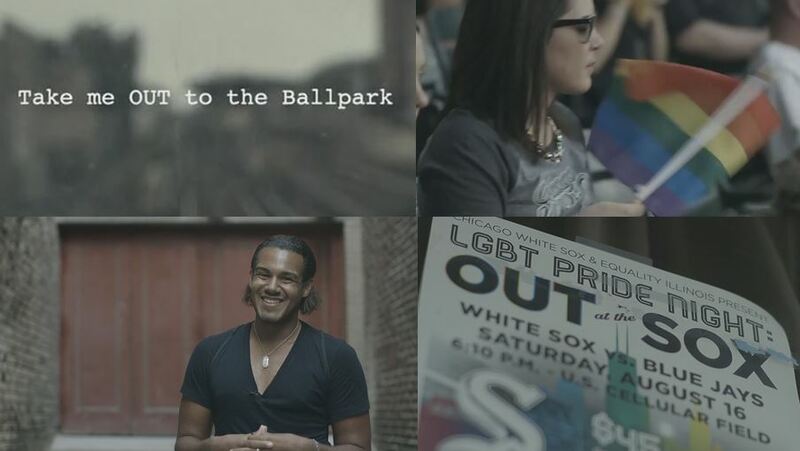 CHICAGO (October 17, 2014) – In late August, the Chicago White Sox hosted an LGBT night in partnership with Equality Illinois. Anti-gay fans ranted on social media about whether the White Sox should host such a night. After reading through the disparaging comments, award-winning Chicago filmmaker Sam Ciaramitaro, who has spent his career as a director and producer of national TV commercials, episodic TV series and documentaries, decided to make this short film, “Take Me OUT to the Ballpark,” in response. The film focuses on five Sox fans who happen to be LGBT or support LGBT rights. Ciaramitaro filmed them prior to attending the Sox/LGBT Pride game in August. In the film, the fans discuss how they just want to go to a baseball game, spend time with their friends, be accepted by others and live their lives the best they know how. The fans include Charlie Rice-Minoso, the son of Sox immortal Minnie Minoso, an emergency room nurse, and the mom of a gay son. Working through Major League Baseball Productions, the White Sox, and Equality Illinois, Ciaramitaro obtained permission to shoot the documentary, which included recording at the pre-game party at Crew Bar in Chicago’s Uptown neighborhood and at the game in U.S. Cellular Field. Equality Illinois, the state’s oldest and largest advocacy organization for lesbian, gay, bisexual and transgender Illinoisans, benefited from ticket sales, as do many other groups that partner with the Sox. View “Take Me OUT to the Ballpark” at Sam Ciaramitaro’s website http://astorbanks.prosite.com/333004/film, on YouTube http://youtu.be/VREDw4H5YzU, and Vimeo http://vimeo.com/106873436.